Unfortunately, the shepherds have been disappearing at such a rapid pace that in 2006, Portuguese director, Jorge Pelicano, made an award-winning documentary film following the lives of these last isolated workers of the Serra called, Ainda há Pastores? (Are there Still Shepherds?). Below is a video of the trailer for the film, which I found very moving. Even two of the aging shepherds from the film had tried to force their children to stay in the mountains and carry on the business. Two years later, their teenage daughter Rosa (nicknamed Rosa Brava or “Brave Rose”) was featured in a news report showing how her parents took her out of school to transform her into a shepherd, but all she wanted was to live an ordinary teenage life and go to school. Therefore, it’s not surprising why so few people are “flocking” to this job, and with the global pattern of the last 20 years showing a steady increase of young people abandoning their small hometowns for job opportunities in large cities, there are few brave souls to left to take over their parent’s well-honed skill. 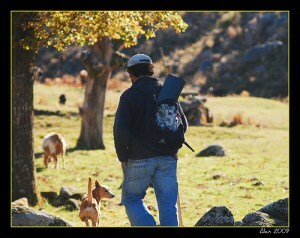 And why does a growing number of the Portuguese become concerned with the health of the Portuguese shepherd population? Because the sheep’s milk of Serra de Estrela is used to make Portugal’s most famous DOP Serra de Estrela cheese! Now, this is not to say that cheese production will cease due to lack of sheepherders, but the cultivation will become entirely commercialized, with sheep only being raised on standard commercial ranches and milked in bulk by machines. Studies have shown that animals raised commercially are more stressed than free-range, whereby effecting the quality and flavor of their milk. Additionally, the small family cheese production will eventually die out, along with the age old tradition and technique, without the shepherds providing the base ingredient. Upon leaving our getaway of Serra de Estrela, with a couple rounds of cheese and presunto ham, my last burning questions were: What’s going to happen with the shepherds of Estrela? Are we just going to watch this craft slowly go extinct? Or is anyone here now going to do something about it? What I didn’t know before, but makes perfect sense now, is that the shepherds are not only just an important factor in cheese production, but also a very important in the prevention of forest fires that wreck havoc throughout the mountains of Portugal every summer. This particular summer has been extraordinarily harsh, and coincidentally, one of the days we happened to be in Serra last month was reported to be the highest count of forest fires throughout Portugal in a long time. This was clearly evident to us from the orange haze over the mountain due to smoke blowing from nearby fires. However, Serra de Estrela itself appeared to be spared of actual fires, maybe thanks to that last handful of watchful shepherds we saw traveling all over the mountain with their good spotting eye. (Sadly though in other regions of Portugal, cattle shepherds have recently been arrested as suspected setters of forest fires supposedly in order to produce more pasture land for their cattle). It’s called “Project Self-Prevention” and was presented by the European Grouping of Territorial Cooperation (EGTC) Duero-Douro, as a method of forest fire prevention and sustainable rural development. The initiative is to introduce 150,000 goats in the Portugal- Spain border areas so that these goats do a natural “cleanup” of abandoned farmland, hills and trenches as they eat, says the publication by Más Salamanca. The project, which will need an investment of about 50 million Euros, aims to create over 500 jobs, according to El Mundo. In addition to jobs for farmers and shepherds the EGTC Duero-Douro (comprising 63 locations across borders between Portugal and Spain) aims to build 12 cheese factories, 15 shops and marketing of processed goat’s milk products, two slaughterhouses, a platform for distribution and transport and a central facility for marketing, says the Spanish newspaper. “We also intend to explore a central biomass to produce electricity through the use of organic matter of these places, and is also aimed at the creation of several tourism resources around the goat.” The aim is to achieve an annual turnover of 30 million euros from the sale of dairy products, as well as the goats that sell for meat. The project has the commitment of the Portuguese Government to support 50% of necessary funding, said the director general of the EGTC, Jose Luis Pascual, quoted by El Mundo. The area of activity of the project stretches over a bordering territory of 9,000 square kilometers and 125,000 inhabitants. So is this the answer? Since it’s only going to promote goat herding then probably not, but I think it will definitely help raise awareness. But what else can be done? What about supporting the remaining shepherds still wandering alone and struggling to make a living in Serra de Estrela? Is the end to this craft inevitable and we should go visit the Serra to watch these peaceful herdsmen and experience the “cheese of their labor” before they’re all gone? Or is there still time to keep it alive? I want your opinion.